Introduction: Biomechanical preparation (BMP) of root canal damages the root dentin which becomes a gateway to dentinal cracks and thereby causing failure of the treatment. Therefore, there is a need of best instruments to minimize the failure of endodontic treatment. Aims and Objective: The objective of this study is to compare the incidence of cracks observed in the root dentin after root canal preparation with three different rotary instrument systems. 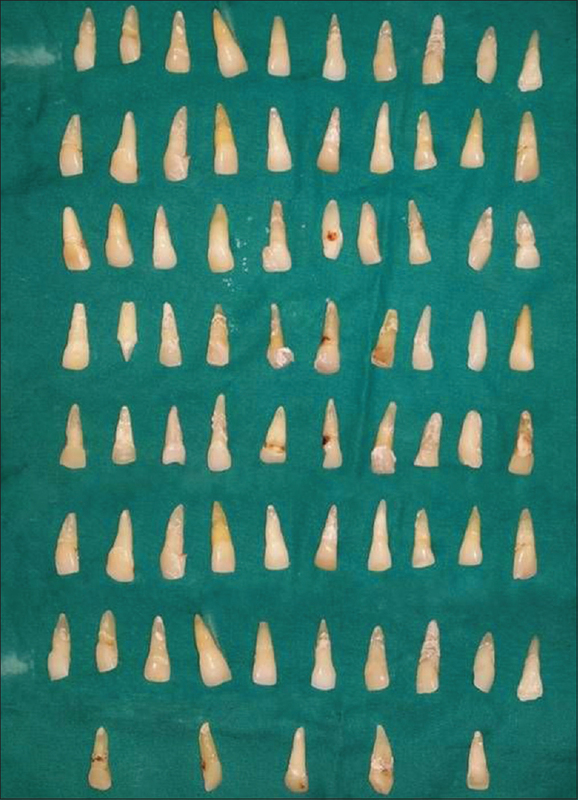 Material and Methods: Seventy-five freshly extracted permanent maxillary incisors were randomly selected. Teeth were divided into five groups (n = 15), Group 1 – Untreated (negative control group), Group 2 – BMP done with nickel–titanium K-files (positive control group), Group 3 – BMP done with ProTaper Universal files, Group 4 – BMP done with ProTaper Next files, and Group 5 – BMP done with HyFlex EDM files. Roots were sectioned horizontally at 2 mm, 4 mm, and 6 mm from the apex. All slices were then viewed under stereomicroscope. All findings were analyzed using Chi-square test. Observations and Results: In the apical third, Group 5 had maximum number of fracture cases while Group 4 had lesser number and Group 3 had the least. In the middle third, Group 3 had maximum number of fracture cases while Group 4 and Group 5 showed lesser number of fractures. In the cervical third, Group 3 and Group 4 showed equal and maximum number of fracture cases. Group 5 showed no fracture cases. Group 1 and Group 2 showed no fracture cases in all the root sections. Conclusion: Conventional hand instrumentation is the best as compared to rotary instrumentation. However, rotary systems render various benefits with an acceptable success in comparison to the conventional hand instrumentation. In our study, we found that HyFlex EDM rotary system was the best with least number of fracture as compared to other systems used. Endodontic success in children depends on multiple factors including root canal preparation, disinfection, and obturation. Unfortunately, at times, biomechanical preparation (BMP) of the canals damages the root dentin which becomes a gateway to dentinal cracks and minute intricate fractures or even vertical root fracture, thereby causing failure of the treatment. 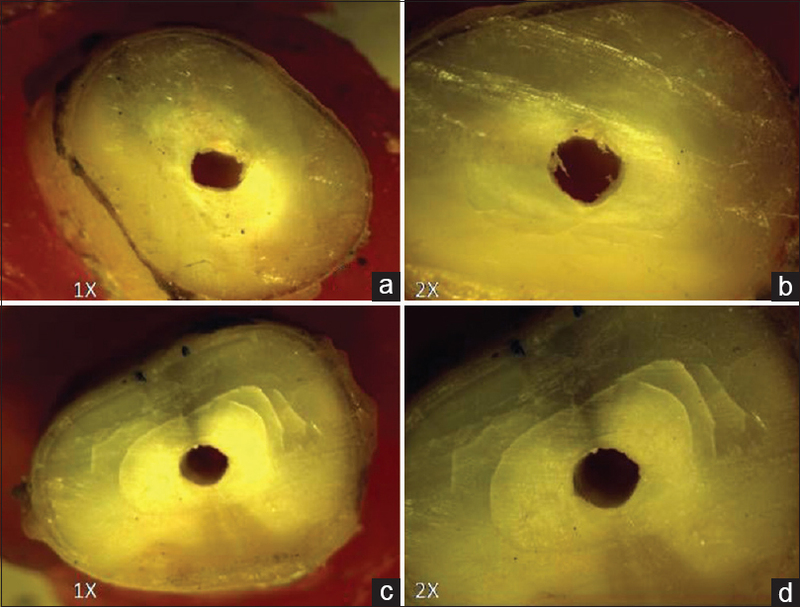 Due to the complexities in canal anatomy, researchers have been trying to give variation in the designing of endodontic cutting instruments, taper, and composition of the material. Earlier stainless steel hand files were extensively used, but it has a propensity to create aberrations as a result of inherent stiffness of metal which limits its use in narrow curved canals and apical enlargement, thus hindering obturation. To counter the drawbacks of the stainless steel instruments, various companies have come up with various endodontic instruments with enhanced flexibility and superior resistance to torsion fracture. Each one has advantages as well as disadvantages. There are no data in the literature on the comparative evaluation of different rotary systems such as (nickel–titanium [Ni–Ti] Files), ProTaper Universal, ProTaper Next, and HyFlex EDM on incidence of root microcracks. Thus, this study will help to understand the damage caused within the canal wall at different horizontal cross-sectional levels after root canal shaping performed with these files, especially in pediatric patients, which makes this study unique. 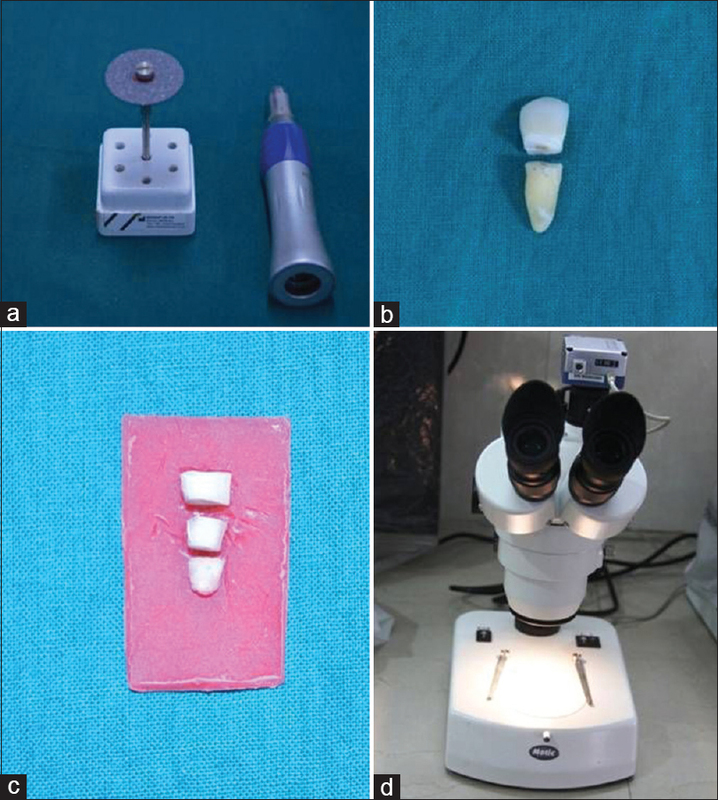 This in vitro case–control study was conducted in the Department of Pediatric and Preventive Dentistry of D. Y. Patil School of Dentistry, Nerul, Navi Mumbai, with an aim to compare the incidence of cracks observed in the root dentin after root canal preparation with three different rotary instrument systems, namely, (1) ProTaper Universal, (2) ProTaper Next, and (3) HyFlex EDM, keeping stainless steel K-hand files as control group, and approval was taken from the D. Y. Patil University Ethical Committee. A total number of 75 freshly extracted incisors were randomly selected and stored in purified filtered water for the study until further processing. Soft tissue and calculus were mechanically removed from root surfaces [Figure 1]. 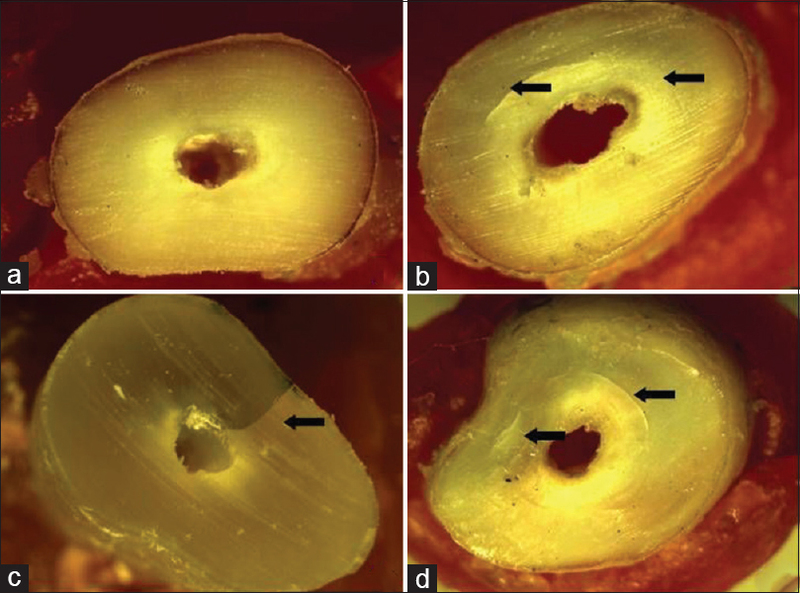 Tooth with completely formed apex were included in the study. Teeth with root caries were excluded from the study. Teeth were divided into five groups (n = 15) [Figure 2] and [Figure 3]. Group 5 – BMP done with HyFlex EDM files. 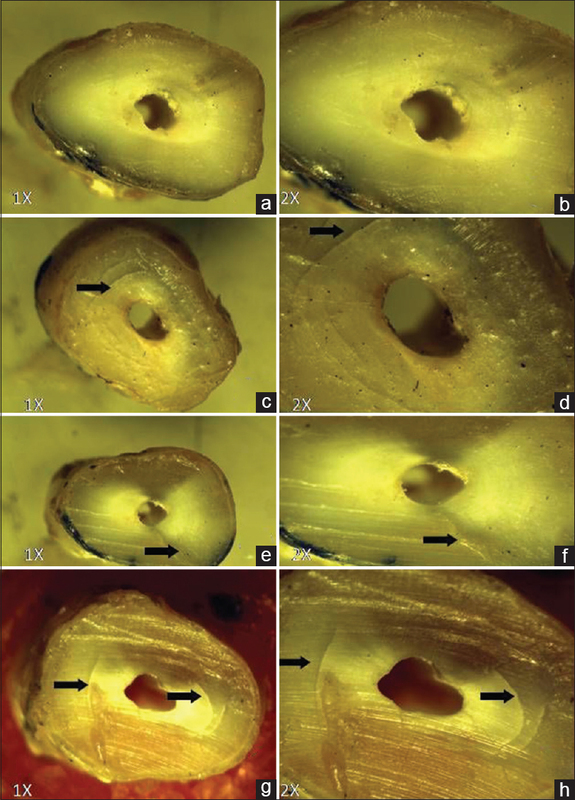 The crowns were removed using a low-speed saw with water cooling, leaving roots approximately 12 mm in length [Figure 4]. In all the teeth, apical patency was determined by inserting a size 20 K-file (Mani, Japan) into the root canal until its tip was visible at the apical foramen, and the working length (WL) was set 1.0 mm shorter of this measurement. Each instrument was replaced after preparing four canals. Each canal was irrigated with 3% solution of sodium hypochlorite between each instrument by using a syringe and a 27-gauge needle. After completion of the procedure, canals were rinsed with 2 ml distilled water. All roots were kept moist throughout the procedure. Group 1 was left untreated and served as a negative control. In Group 2, the BMP was done with K-files sizes 10, 15, 20, 25, 30, 35, 40 in a circumferential quarter-turn push-pull filing motion, using balance force crown down and step-back 1-mm increments with K-files #45–80, resulting in a preparation with a taper of about 0.05. These teeth formed a positive control group. In Group 3, the BMP was done with ProTaper rotary files (Dentsply Maillefer) that were used sequentially at the speed of 300 rpm to prepare the canals. Sx file was used to enlarge the coronal portion of the canal, and then, all files were used till the WL: S1-S2-F1-F2-F3-F4. The first two shaping files were used with a torque of 1.5 N.cm in a brushing motion along the root canal walls away from the root concavities before light resistance was encountered. The last four finishing files were used until the WL was reached with a torque of 2.5 N.cm. The last file used was F4, which corresponds to file 40 with a taper 0.06 at the apical area. In Group 4, the BMP was done with ProTaper Next rotary files (Dentsply Maillefer). The ProTaper Next files were used in the sequence ProTaper Universal SX for coronal flaring and then ProTaper Next X1 (17/.04), X2 (25/.06) till the full WL for root canal shaping. X3 (30/.07) and X4 (40/.06) were also used till full WL for root canal finishing. All these files were used at a rotational speed of 300 rpm and 2.5 N.cm torque. Each file was used with a touch-and-brush motion similar to that used with the ProTaper Universal files. In Group 5, the BMP was done with HyFlex EDM files. These files were used in a gentle in-and-out motion with a rotational speed of 500 rpm and 2.5 N.cm torque. The HyFlex files were used in the sequence of 25/.12 which is the orifice opener followed by using the 10/.05 glide path file up to the WL to create a glide path. Then, HyFlex EDM 25/~ Onefile for enlargement of the root canal till the WL was used. The last file used to enlarge the apical section was the finishing file: 40/.04. To standardize procedures and avoid variables during specimen preparation, only one operator conducted the experiments. To avoid confusion, observations were divided into four categories: (1) no defect (root dentin devoid of any lines or cracks where both the external surface of the root and the internal root canal wall had no defects), (2) defect (all lines observed on the slice that extended either from the outer surface into the dentin or from the root canal lumen to the dentin), (3) fracture (line extending from the root canal space to the outer surface of the root), and (4) fracture and defect (where both were seen) [Figure 5]. All the observations were tabulated and analyzed using Chi-square test. In the apical third, Group 5 had maximum number of fracture cases (6) while Group 4 had lesser number (5), Group 3 had the least (1), and Group 1 and Group 2 showed no fracture cases (0) [Table 1]. In the middle third, Group 3 had maximum number of fracture cases (8) while Group 4 and Group 5 showed lesser number of fractures (3) and (2), respectively, Group 2 showed the least (1) and Group 1 did not show any fracture cases (0) [Table 2]. In the cervical third, Group 3 and Group 4 showed equal and maximum number of fracture cases (3) while Group 1, Group 2, and Group 5 showed no fracture cases (0), (0), and (0), respectively [Table 3]. When compared between the groups, P value for the Chi-square test is lesser than that of 0.05 in apical and middle third which indicates that there is significant association between the groups at the apical and middle levels, whereas P value being greater than 0.05 in the cervical third indicates no significant association at the cervical level between the groups. In Group 1, no fracture cases were found in the apical third (0), middle third (0), and cervical third (0) [Table 4] and [Figure 6]. In Group 2, maximum number of fracture cases were found in the middle third (1) while apical third and cervical third did not show any fracture cases (0) and (0), respectively [Table 5] and [Figure 7]. In Group 3, maximum number of fracture cases were found in the middle third (8) followed by cervical third (3) and apical third (1), respectively [Table 6] and [Figure 8]. In Group 4, maximum number of fracture cases were found in the apical third (5) followed by equal number of fracture cases in the cervical third (3) and the middle third (3), respectively [Table 7] and [Figure 9]. In Group 5, maximum number of fracture cases were found in the apical third (6) followed by the middle third (2) and cervical third did not show any fracture cases (0) [Table 8] and [Figure 10]. When compared within the groups, P value for the Chi-square test is lesser than that of 0.05 which indicates that there is significant association between apical, middle, and cervical thirds for Group 1, Group 2, and Group 3. Whereas P value being greater than 0.05 for Group 4 and Group 5 indicates no significant association between their apical, middle, and cervical thirds. Clinical endodontics encompasses a number of treatment options, but perhaps, the most important is treating pulp and root canal systems so that patients can retain their natural teeth in function and esthetics. Loss of alveolar bone support. Mostly, fracture is a result of the gradual propagation of tiny cracks in tooth structure and not immediate effect of root canal therapy. Various canal instrumentation techniques have been found to induce the formation of such cracks, resulting into fracture. Bier et al. (2009) also suggested that fractures did not occur immediately after canal preparation. However, craze lines occurred in 4%–16%, which may develop into fractures. In this regard, root canal preparation with Ni–Ti rotary systems and every following additional procedure in endodontics can create fractures or craze lines. One of the important objectives of root canal preparation is to shape and clean the root canal system effectively while maintaining the original configuration without creating any iatrogenic events. Preparation of the root canal system is recognized as being one of the most important stages in root canal treatment which includes both enlargement and shaping of the complex endodontic space together along with its disinfection. A variety of instruments and techniques have been developed and described for this critical stage of root canal treatment. Over the last few decades, endodontics has undergone a complete revolution with the introduction of the Ni–Ti alloy for the manufacture of manual instruments initially and then the rotary endodontic instruments. Studies have shown that defects appear on root dentin wall after the initial treatment with Ni–Ti rotary instruments. Tooth type, canal wall thickness, root canal diameter, cross-sectional shape, root canal preparation instruments, and preparation methods might all be involved in the increased risk for tooth fracture during and subsequent to endodontic therapy. Therefore, the aim of this study was to evaluate the defects in root dentin after root canal preparation. Samples were stored in purified filtered water. This medium was previously recommended for investigation of human dentin (Saber SE and Schafer E. 2016) as it causes the smallest changes in dentin over time. Decoronation of all the specimens was done using low-speed saw with water coolant. Decoronation eliminates some variables, such as the anatomy of the coronal area and access to the root canals allowing a more reliable comparison between endodontic treatment techniques as given by Masiero and Barletta in 2005. In all the teeth, canal patency was established with size 20 K-file (Dentsply Maillefer). Thereafter, canals were prepared with ProTaper Universal rotary, ProTaper Next rotary instruments (Dentsply Maillefer), and HyFlex EDM rotary instruments (Coltene Whaledent) using a torque control motor (X-smart, Dentsply Maillefer). Each canal was irrigated with 3% solution of sodium hypochlorite between each instrumentation. After completion of the procedure, canals were rinsed with 2 ml distilled water. All roots were kept moist throughout the procedure. Stainless steel hand K-files had been used for BMP in many previous studies, and thus, it served as a positive control group in the present study. K-files up to size 40 were used followed by step-back preparation till size 80. We observed only one fracture in our sample size of 15 in this group, which according to our observation maybe due to the uncontrolled pressure used during BMP leading to excessive dentin removal. This is on the contrary to the results found by Çiçek et al. where hand K-files did not produce microcracks at any level. Although the use of hand files is more time consuming, it results in cleaner canal walls in the apical third as compared with the engine-driven Ni–Ti rotary systems. We used crown-down technique of instrumentation for the rotary group as it is said to provide increased cutting efficiency and faster instrumentation and prevents the binding and the separation of the instrument in the canal as reported by Ruddle. It also facilitates adequate irrigation and obturation of the canals. Despite the variations in the morphology of natural teeth, attempts were made in the present study to ensure comparability of the experimental groups. Therefore, the teeth in all groups were balanced with respect to the apical diameter and the length (distance between apex and cementoenamel junction) of the root canal. Thus, the final apical preparation was set to size 40 in each of the groups to ensure comparability between the groups which is in accordance with the study conducted by Bürklein et al.(2015). Yoldas et al. 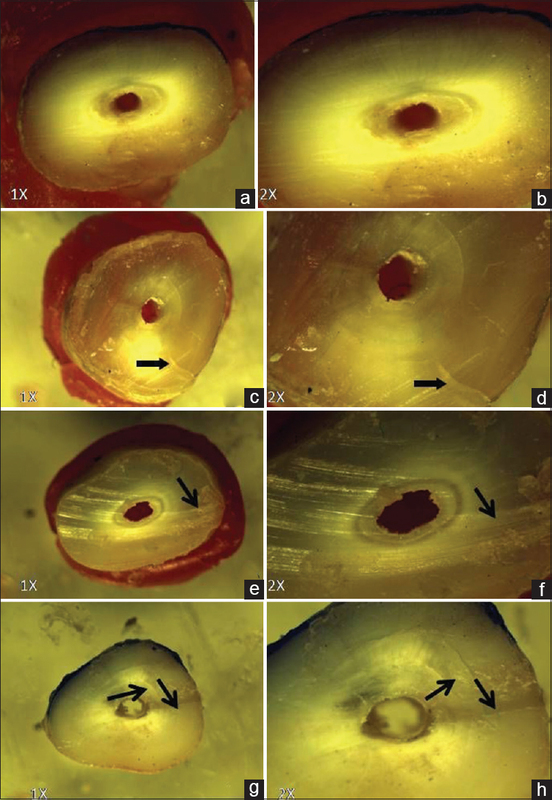 in their study stated that the tip design of rotary instruments, cross-sectional geometry, constant or variable pitch, and taper, flute form could all be related to crack formations in the root dentin. The ProTaper system (Dentsply/Maillefer, Ballaigues, Switzerland) introduced in 2000 was used for instrumentation of the teeth in the Rotary Group 3. ProTaper Universal system consists of a set of six instruments (three shaping files – Sx, S1, and S2 for the crown-down procedure and three finishing files – F1, F2, and F3 for apical shaping) with progressive taper. In 2006, two new files, F4 and F5, were added for apical finishing. It allows the operator to achieve cleaning and shaping of the canal using less number of files. It has been claimed that progressive taper prevents a “taper-lock” situation as seen in other systems. Instruments are triangular cross-sectionally, reducing the contact area between the file and dentin. They have modified guided tips, varying tip diameters, varying helical angles and pitches, and available in 21 mm lengths. The ProTaper system has shaping files with partially active tips while the finishing files have noncutting tips as stated in the study done by Sanghavi and Mistry. Berutti et al. (2003) reported in their study that ProTaper Universal system is shown to have a lower risk of instrument separation when compared to other system due to its triangular file design. It has been suggested that the variable taper design of ProTaper lowers the screw-in effect causing less apical transportation and has better canal centering ability. Furthermore, the benefit of such a design according to the manufacturer is reduced torsional loading. ProTaper when compared with other rotary systems created more regular canal diameters that helped achieve a higher quality of root canal filling by increasing clinical success. In our study, rotary ProTaper F3 file has been used which has a larger apical taper of 0.09 which could explain the higher incidence of damage observed in this group as compared to any other group which is on similar lines with the study done by Rahman et al. Barreto et al. and Liu et al. stated that ProTaper Universal finishing files (F1, F2, and F3) have more taper (0.07, 0.08, and 0.09, respectively) compared to the other rotary systems, thus explaining the higher incidence of cracks observed in the ProTaper Universal group which correlates with the findings of the current study. Furthermore, Shemesh et al., Al-Zaka, and Liu et al. in their study when compared the incidence of dentinal defects using different Ni–Ti rotary files observed that ProTaper Universal resulted in the maximum number of defects which is in accordance with our study. Grande et al. stated about new generation Ni–Ti system in endodontics that the use of multiple and progressive taper provides the advantage of involving a smaller dentin area that reduces torsional loadings, stress, and subsequently, fracture risk. However, a study by Kim et al. reported that tapered files produce increased stress on the canal walls. Furthermore, Rahman et al. 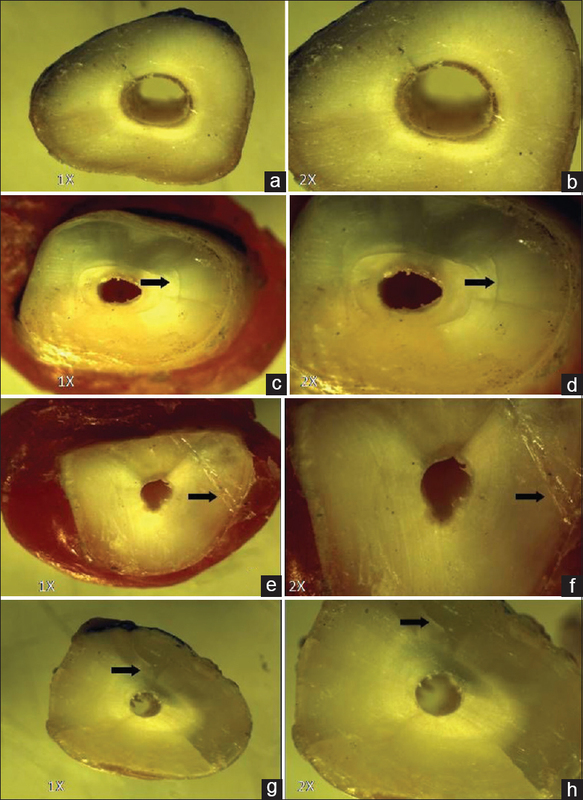 reported that high level of stiffness of the rotary ProTaper Universal files which is explained by a larger cross-section design because of its progressive taper generates higher stress concentrations in the root dentin resulting in excessive removal of the dentinal wall raising the risk of dentinal defects leading to root cracking and weakening of the instrumented root. The ProTaper Next system has been launched recently in the year 2013 by Dentsply Maillefer. There are five instruments in the system for shaping canals, namely, X1, X2, X3, X4, and X5, but manufacturer suggests that most canals can be prepared using only the first two files. This system like ProTaper Universal system makes use of the multiple progressive taper concept, but the difference being that each file presents with an increasing and decreasing percentage tapered design on a single file concept as stated by van der Vyver PJ and Scianamblo MJ (2014) in their article. Liu et al. reported cracks in 50% of the permanent mandibular incisor roots instrumented with ProTaper Universal instruments. However, Yoldas et al. observed cracks in 30% of the mesial canals of permanent mandibular molars; moreover, Bier et al. found cracks in 16% of the mandibular premolar root canals. These contradictory results may be due to a number of reasons, and the most likely one is the difference in the root canal anatomy. In permanent maxillary central incisor teeth, root canals are comparatively wider and oval than other permanent teeth. Circular canals showed lower and more uniform stress distributions than oval canals in which greater stresses were recorded at the cervical and middle thirds leading to higher risks of fractures, which were shown in a study by Versluis et al. that was conducted on permanent mandibular incisors using ProTaper Universal rotary system; thus, this explains the cause of increased fracture formation in the middle thirds of our study. Pereira et al. (2012) and Peters et al. (2014) in their studies observed that endodontic instruments manufactured with M-wire alloy and controlled memory Ni–Ti exhibit more flexibility than conventional Ni–Ti rotary instruments. Since HyFlex EDM instruments are manufactured from M-wire alloy, they exhibit high flexibility and would have thus contributed to smaller number of cracks in the present study. Peters et al. (2014) stated that increased rotational speed was associated with increased cutting efficiency. In our study, smaller number of fractures in the HyFlex EDM group compared with that of ProTaper Universal group and ProTaper Next group might be related to their higher flexibility, relatively higher cutting efficacy, and extended fatigue resistance. In our study, HyFlex EDM rotary instrument system showed the least number of fractures as compared to ProTaper Universal and ProTaper Next groups; hence, it is advisable to use HyFlex EDM system in pediatric patients due to its high flexibility, high cutting efficiency, and extended fatigue resistance which leads to least damage to the root canal walls. Guidelines on Pulp Therapy for Primary and Immature Permanent Teeth. American Academy of Pediatric Dentistry, Clinical Guidelines; 2009. Orstavik D, Pitt-Ford TR, editors. Essential Endodontology. Prevention and Treatment of Apical Periodontitis. New York: Wiley-Blackwell; 2008. Kim HC, Lee MH, Yum J, Versluis A, Lee CJ, Kim BM, et al. Potential relationship between design of nickel-titanium rotary instruments and vertical root fracture. J Endod 2010;36:1195-9. Rahman H, Chandra A, Singh S.In vitro evaluation of dentinal microcrack formation during root canal preparations by different NiTi systems. IJRD 2014;2:43-7. Sanghavi Z, Mistry K. Design features of rotary instruments in endodontics. J Ahmedabad Dent Coll Hosp 2011;2:6-11. Parashos P, Messer HH. The diffusion of innovation in dentistry: A review using rotary nickel-titanium technology as an example. Oral Surg Oral Med Oral Pathol Oral Radiol Endod 2006;101:395-401. Saber SE, Schäfer E. Incidence of dentinal defects after preparation of severely curved root canals using the reciproc single-file system with and without prior creation of a glide path. Int Endod J 2016;49:1057-64. Çiçek E, Koçak MM, Sağlam BC, Koçak S. Evaluation of microcrack formation in root canals after instrumentation with different NiTi rotary file systems: A scanning electron microscopy study. Scanning 2015;37:49-53. Ruddle CJ. Cleaning an shaping root canal systems. In: Cohen S, Burns RC, editors. Pathways of the Pulp. 8th ed., Ch. 8. St. Louis: Cohen and Burns, Mosby/Harcourt; 2002. p. 231-91. Bürklein S, Mathey D, Schäfer E. Shaping ability of ProTaper NEXT and BT-RaCe nickel-titanium instruments in severely curved root canals. Int Endod J 2015;48:774-81. Vaudt J, Bitter K, Kielbassa MA. 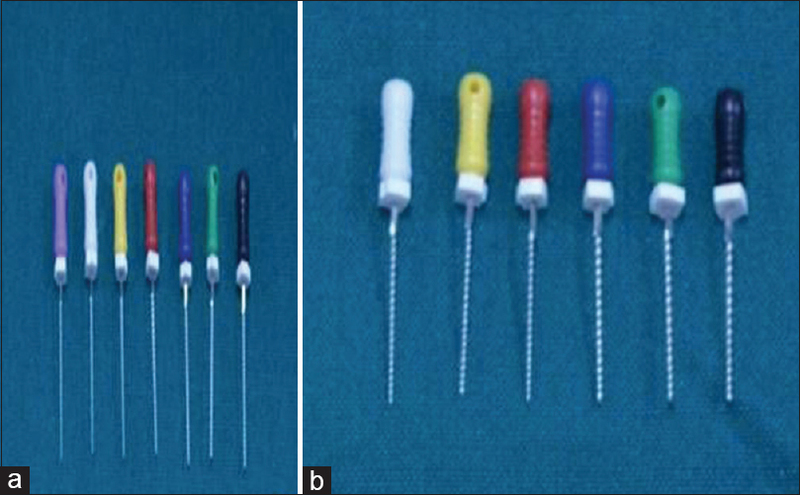 Evaluation of rotary root canal instruments in vitro: A review. Endodontology 2007;1:189-203. Berutti E, Chiandussi G, Gaviglio I, Ibba A. Comparative analysis of torsional and bending stresses in two mathematical models of nickel-titanium rotary instruments: ProTaper versus ProFile. J Endod 2003;29:15-9. Guelzow A, Stamm O, Martus P, Kielbassa AM. Comparative study of six rotary NiTi systems and hand instrumentation for root canal preparation. Int Endod J 2005;38:743-52. Barreto MS, Moraes Rdo A, Rosa RA, Moreira CH, Só MV, Bier CA, et al. Vertical root fractures and dentin defects: Effects of root canal preparation, filling, and mechanical cycling. J Endod 2012;38:1135-9. Al-Zaka IM. The effects of canal preparation by different NiTi rotary instruments and reciprocating WaveOne file on the incidence of dentinal defects. M Dent J 2012;9:137-42. 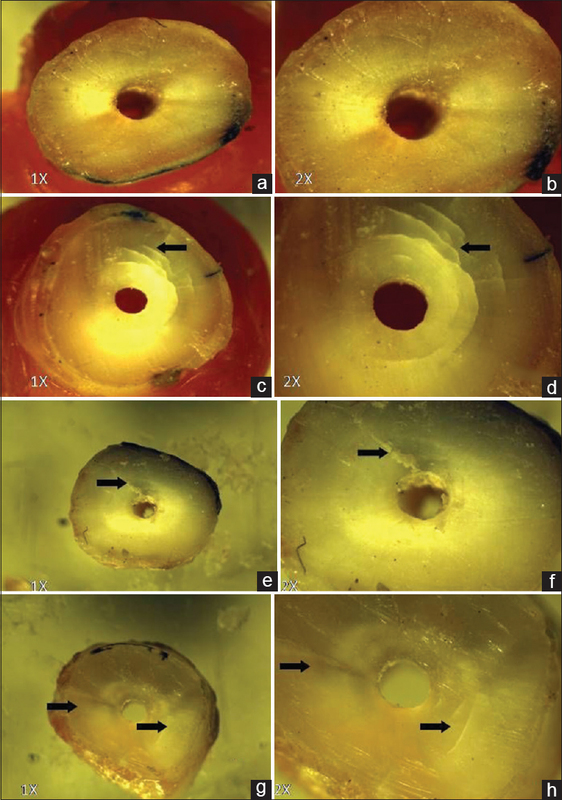 Liu R, Hou BX, Wesselink PR, Wu MK, Shemesh H. The incidence of root microcracks caused by 3 different single-file systems versus the ProTaper system. J Endod 2013;39:1054-6. Grande NM, Plotino G, Butti A, Buono L. Modern endodontic NiTi systems: Part I: “New Generation” NiTi systems. Endod Ther 2005;5:11-6.
van der Vyver PJ, Scianamblo MJ. Clinical guidelines for the use of PROTAPER NEXT™ instruments: Part one. Endod Pract 2014;16:33-40. Versluis A, Messer HH, Pintado MR. Changes in compaction stress distributions in roots resulting from canal preparation. Int Endod J 2006;39:931-9. Pereira ES, Peixoto IF, Viana AC, Oliveira II, Gonzalez BM, Buono VT, et al. 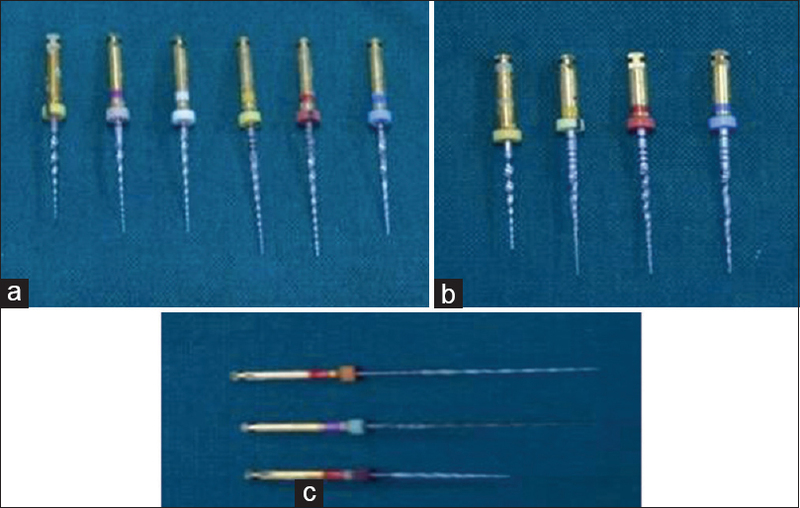 Physical and mechanical properties of a thermomechanically treated NiTi wire used in the manufacture of rotary endodontic instruments. Int Endod J 2012; 45: 469-474. Peters OA, Morgental RD, Schulze KA, Paqué F, Kopper PM, Vier-Pelisser FV. et al. Determining cutting efficiency of nickel-titanium coronal flaring instruments used in lateral action. Int Endod J 2014; 47: 505-513.